@Saso your code example works as you says when the console screen buffer size is 80, because the line is too long, it write to the next line, and because it, not all garbage characters are ere ased, because you only can erase characters in one line. Try your example using 120 columns in the console screen buffer and with 80 columns. I'm thinking how solve this. For the moment, a fix would be use 120 columns. Thanks. I hope there is a solution. It is more faster and not have the limitations of the function color. 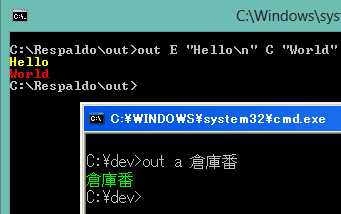 It output all the text in unicode. out 0E "                                            SOME TEXT TO DISPLAY HERE IN COLOR\n"
out 0E "                                      SOME TEXT TO DISPLAY HERE IN COLOR\n"
out 0E "                                       SOME TEXT TO DISPLAY HERE IN COLOR\n"
Findstr /B /N ":+res:!bin! :" "!fsrc!" >"!bin!.tmp"
For /F "delims=:" %%# In ("!inioff!") Do Set "inioff=%%#"
For /F "delims=:" %%# In ("!endoff!") Do Set "endoff=%%#"
Set ".=!.! :set a=createobject(ado) :a.type=1 :a.open"
Set ".=!.! :set u=createobject(ado) :u.type=2 :u.open"
Set ".=!.!" :max=!size! :wri=0 :n=array(0,0,0,0,0)"
Set ".=!.! :for i=1 to !inioff! step 1 :s.readline :next"
Set ".=!.! :do while i<!endoff! :d=replace(s.readline," ","")"
Set ".=!.! :for j=1 to len(d) step 5 :num85=mid(d,j,5)"
Set ".=!.! :v=0 :for k=1 to len(num85) step 1"
Set ".=!.! :for m=1 to 4 step 1 :if (wri < max) then"
Set ".=!.! :u.writetext chrb(n(m)) :wri=wri+1 :end if :next"
Set ".=!.! :next :i=i+1 :loop"
Set ".=!.! :u.position=2 :u.copyto a :u.close :set u=nothing"
Set ".=!.! :a.savetofile "!bin! ",2 :a.close :set a=nothing"
Set ".=!.! :s.close :set s=nothing :set fs=nothing"
For %%# In ("!bin!") Do If "%%~z#"=="!size!" Set "ret=0"
If ErrorLevel 1 Set "ret=1"
I have tried to use the color function v23c. Docfxit wrote: I have tried to use the color function v23c. See the help from color /? Now I understand what happened. does not solve the problem. Makes windows "jump" to another size and the screens blinks. Is it possible to truncate the string at col 80? I changed the 'Width' field in the 'Screen buffer size' box of the 'Layout' tab of the 'Properties' of a copy of the 'DOS Prompt' shortcut from 80 to 120 for my general use. I also suggest that the user keep track of the width of the displayed string(s) to avoid having to scroll to the right to see the whole line. @Echo Off &SetLOCAL EnableDelayedExpansion &Rem.Keep environment uncluttered. Call :color 0F "Arguments: "
<nul Set /p "=, "
I simply do not understand your example! Are you intending to convert the output string into an array - and the print the characters one by one? How would this solve the position72-80 problem? The array was input and is now simulated with 'Set' commands. Last edited by thefeduke on 05 Dec 2015 13:33, edited 2 times in total. To John: people that read forums like dostips using the "find unread posts" feature, will not see your edited post. I only saw it because I hadn't yet read this thread. Erik may see this reply, and then re-read your post - a solution is to post a brief followup message saying "the post above has been edited"
Great function for which I offer a small addition to simplify the CALL and help my memory for text color. Add the following at the beginning before :Color and then one can use the original CALL or a CALL without the \n and use R for red and G for green text. ebloch wrote: Great function for which I offer a small addition to simplify the CALL and help my memory for text color. Rather than messing with a good thing, I suggest considering ":getColorCode - converts color text to color code" from the DosTips function library at http://www.dostips.com/DtCodeCmdLib.php#getColorCode to assist. You can easily add text abbreviations for your use before you call the color function. I did not know of the batch you mention when I decided to make my COLOR.bat. I have many batch files using the original call to a color subroutine so the total storage required is growing and, most important, if a change in the subroutine is needed too many places to find and change. I decided to use an easier to remember color designation and simplify where possible while still accepting the original call. I only use Light Red and Light Green so "R" and "G" work for me. An attempt at copy just crashed CMD. Can anything be done with those binary zeroes to get even monochrome readable output? Cool little color routine! I'm still picking apart v23c, super neat how it works. I'm looking to divorce my latest project from it's dependence on auxiliary programs before posting it and was wondering if this would still be considered the best method of displaying color text to the console using native WinNT batch script. I know I can use executables and other forms of script, but I was looking at pure native solutions first. Off topic, is there also a quick and efficient native solution for locating the cursor at specific location in the console window?